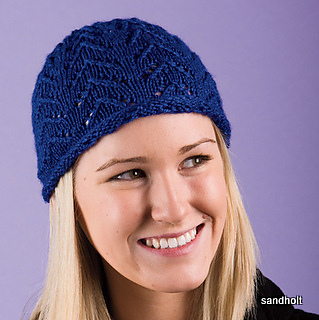 This close fitting hat with a simple lace pattern is knit in a DK or light worsted type of yarn. To make a nice firm edge and perfect fit, the hat is finished off with a crochet edge. It can be knit either in the round or flat - pattern includes instructions for both. The pattern has written instructions as well as charts for each of the six sizes, from baby to men’s. It should be suitable for an advanced beginner.